Didn’t Trump campaign on a stronger military, to crack down on ISIS? To make America safer again? He did, and so the head-scratching began. It was especially odd considering that Trump signed off on a HUGE increase in defense spending in August. The 2019 National Defense Spending Authorization Act has a budget of $717 billion that will raise America’s troop levels to the highest in a decade. The NDSAA allocated $616.9 billion for the Pentagon, $69 billion for overseas operations and $21.9 billion for nuclear weapons programs. Among the big-ticket items set out in the act are 77 F-35 Joint Strike Fighters, of which Turkey will receive two of the new jets, $85 billion for the Black Hawk helicopter program, $1.5 billion for littoral combat ships and funding for the Air Force’s new long-range stealth B-21 bomber. Trump has doubts about the value in supporting many overseas partners and commitments. Thompson identifies South Korea, Germany and Afghanistan (Trump announced a month ago that US troops were pulling out of the country) as examples. This article will discuss why the growing militarization of the United States as it gears up for what could be super-power confrontations with Russia and China, and the way that defense spending feeds the ever-alarming national debt, are good for gold – the ultimate safe-have asset to hold in times of high international tensions, as well as a hedge against an unsustainable debt load. Trump can say what he likes about spending on defense being too high and wanting to lower it, through diplomacy of all things. (Trump the diplomat!) The fact is, that’s not going to happen. Trump has ratcheted up the rhetoric and put more skin in the game against China by engaging in an all-out trade war that has yet to be resolved. He’s also confirmed the United States will withdraw from the INF Treaty with Russia, an important arms-control agreement negotiated in the 1980s. The US alleges that Russia has developed a new ground-launched cruise missile that violates the INF treaty prohibition against missiles with ranges from 500 to 5,500 km. On Feb. 1 Trump said he’s giving Russia 180 days to destroy all its missiles, launchers and equipment that violated the 1987 treaty. We have argued the breakdown of the INF treaty could be the catalyst that starts a new arms race between the United States, Russia and China as each projects military power in defense of spheres of influence outside their borders. Why? If the US is no longer tied to a treaty that prohibits short – and intermediate – range nuclear and conventional missiles, the military will have a freer hand in the South China Sea. Up to now the Pentagon has been unable to match China’s increasingly sophisticated land-based missile forces due to the treaty, Reuters reported. For instance China’s DF-26 intermediate-range ballistic missile has enough range (2,500 miles) to reach the US Mainland if fired from Guam. But if the military is allowed to deploy missiles to places like Guam and Japan, it would deter China from a first strike against US ships and bases in the region, the news outlet added, and also force Beijing into a costly arms race. Not being party to the INF treaty would also allow the United States to counter Russian aggression in Eastern Europe. Trump was right to call out the Russians for failing to live up their end of the treaty bargain, by testing ground-launched cruise missiles since 2008 when they invaded Georgia, a former Soviet republic. While many see the recent pro-military moves by Trump as in keeping with his belligerent personality and right-wing beliefs, they might be surprised to learn that his softer predecessor was just as much of a war monger. Under President Obama, a Democrat, the United States made its main hydrogen bomb into a guided smart weapon, its submarine-launched ballistic missiles became five times more accurate, and the military added so many features to its long-range missiles that they were “basically new,” Reuters said. During the same period Russia also upgraded its degraded Cold War weaponry by building more powerful ICBMs and a series of tactical nuclear weapons. Building up the US nuclear arsenal over the next 30 years (from 2017) was estimated to cost $1.2 trillion. Trump, then, is only following the path that Obama laid out, and has even tried to dismantle the gains he did make in disarmament. For example Trump has reportedly denounced the New START treaty (negotiated by the Obama Administration) limiting the US and Russia to 1,550 nuclear warheads each, saying in a phone call with Putin he doesn’t want to extend it beyond 2021. The other reason that cutting the defense budget won’t happen is the inertia of military spending that US defense contractors and the United States’ allies have grown used to. According to the Stockholm International Peace Research Institute (Sipri), as the largest military in the world by far, the US has spent an average $650 billion every year since 2010. 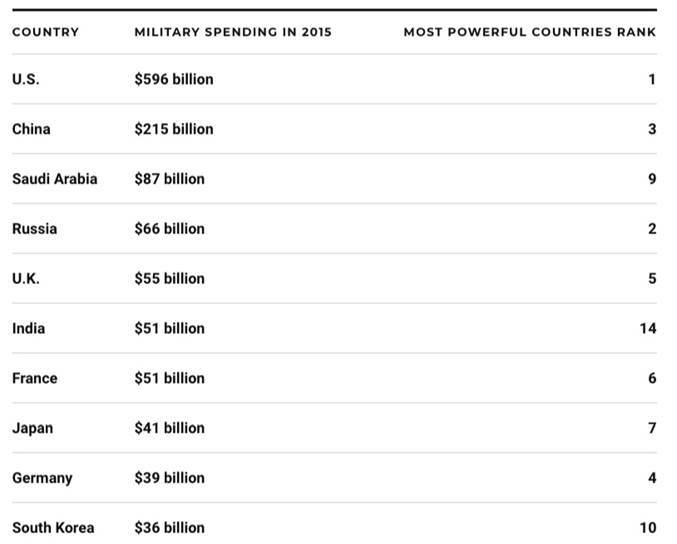 It spends more on defense than the next nine countries combined (chart below). Of this amount, $400 billion is earmarked for nuclear weapons between 2017 and 2026, which is an increase of $52 billion from the previous 10-year estimate of $348 billion, according to a Congressional Budget Office report. This year estimated US military spending is $892 billion, based on the August spending bill mentioned above. That number includes a number of items that are not in the actual Department of Defense budget, which can be misleading. For example the DoD budget does not include nuclear weapons spending, black ops, interest on the defense portion of the debt and ongoing military obligations to veterans. The budget for nuclear weapons falls under the Department of Energy. 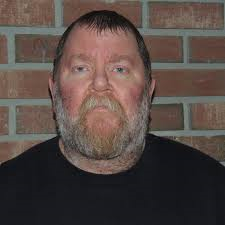 Other military expenses – care for veterans, health care, military training, military aid and secret operations – are put under other departments or are accounted for separately. Not only does the US have easily the most powerful military with enough weapons to destroy the world many times over – about 6,550 at last count compared to Russia’s approximate 6,800 – it is also the biggest arms dealer. A senior research at Sipri told the BBC that the US now exports 34% of global arms sales, an increase of 30% from five years ago. US arms sales are rising as Russia’s, the next largest arms dealer, are falling. This might surprise some people who have been reading Facebook news instead of real news, but not Ahead of the Herd. We noticed this trend of increasing military activity last year starting with Trump’s surprise decision to levy steel and aluminium tariffs on its trade allies but mostly directed at China which was dumping steel in the US. “Our steel industry is in bad shape,” Trump tweeted. “IF YOU DON’T HAVE STEEL, YOU DON’T HAVE A COUNTRY!” Trump is 100% correct. Although he could have taken it one step further, and said without steel, you don’t have a military. The protection of steel and aluminum, and the recent, long-overdue call for the domestic production of 35 strategic metals, is part of a greater plan to build up the American military to counter increasing threats from two historical adversaries: Russia and China. The nerve agent attack in the UK last year was just the latest attempt by Russia to exert its power in a world bereft of clear battle lines. Examples include the annexation of Crimea, military support of Syrian dictator Bashar Al Assad, and Russian meddling in the US Presidential election through Internet trolls. Obama’s “pivot to Asia” was designed to curb Chinese territorial ambitions which include the reunification of Taiwan with China. But the pivot, to be realized through increased trade like the Trans Pacific Partnership and increasing its regional military profile, has been a failure. The US could not prevent China from building islands and annexing 80% of the South China Sea, defend freedom of navigation through the $5-trillion annual trade corridor, or stop China-backed North Korea from conducting nuclear tests. Then there’s the more recent incident, where Canada is caught in the middle, of wanting to extradite the CFO of Huawei for allegedly violating US sanctions on Iran. Escalating trade tensions have been ongoing for almost a year, with billions in import tariffs levied from either side. To this we need to add the simmering pot of unrest that is going on in Venezuela. Troops were reportedly sent to the border with Colombia after the US acknowledged the Opposition leader as interim president. The US responded by flying planes into Colombia. Last week the US sanctioned Venezuela’s state oil company, the boldest action taken so far in the effort to isolate embattled President Nicolas Maduro. The country has been gripped with hyperinflation, soaring unemployment and a mass exodus of refugees. So what is the connection between increasing global conflict, and higher US military spending particularly, on gold? Well, gold is a safe haven in times of political or economic uncertainty, so that’s the first correlation. The second is that military spending feeds into the debt “death spiral” the US finds itself in. Defense is the largest portion of the federal budget behind Social Security. These two items are increasing the debt like never before, adding deficit after deficit to the mounting pile, which currently sits at a jaw-dropping $21 trillion. 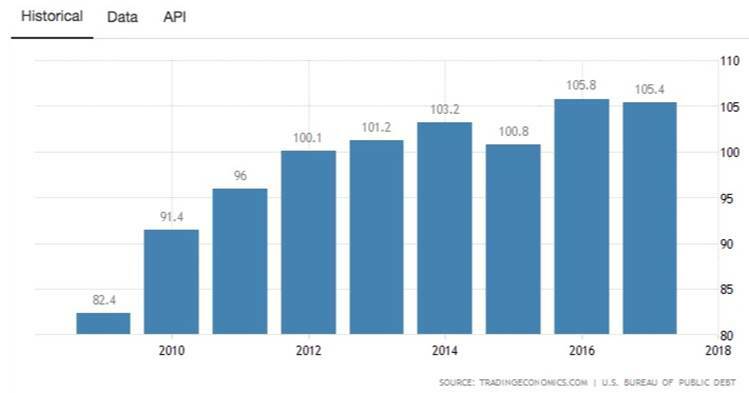 The US has a debt to GDP ratio of 105%. The ratio has increased almost every year since 2010; it was highest in 1946 of 118.9% and lowest in 1981 at 31.7%. The current US deficit is within shouting distance of $1 trillion ($984 billion). The Balance notes this is despite revenues being the highest in US history. The reason? Congress has ramped up deficit spending to pay for record-high levels of military spending, and social security programs due to an aging population. While many are fretting over the unsustainably high level of indebtedness (the US Federal Reserve is extremely limited on how far it can raise interest rates because raising them too high would cost too much interest), the beneficiary has been gold. 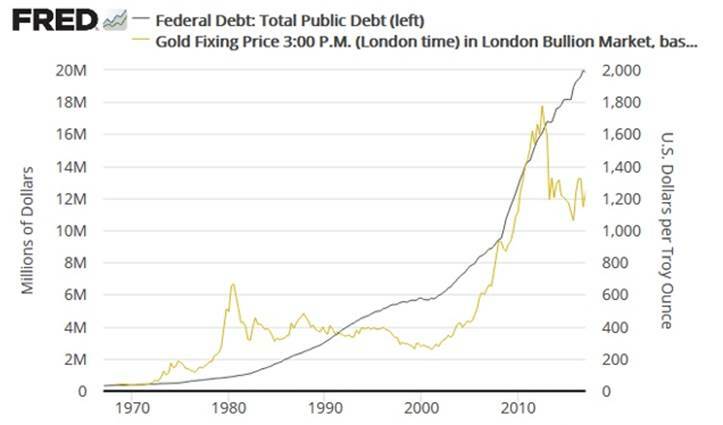 Seeking Alpha published an interesting chart showing the very close match between the size of the federal debt and the gold price. In 2011 and 2012 the price of gold ran over $1,700 an ounce, with deficits over a trillion dollars, at one point reaching close to $1,900/oz. The deficit is approaching $1 trillion this year and gold is only at around $1,311/oz. The world seems to be getting more dangerous every day, despite the circus of social media and the shenanigans in Congress over the (partial) government shutdown. We need to be constantly aware of what is happening beyond North America not only to decide where we travel and what we should be afraid of, but for economic reasons as well. Military spending might (or might not) keep people safe, but with America’s current fiscal situation, it will also keep it in debt servitude. Until something can be done to correct this ticking time bomb, the best defense against the repercussions of a mounting pile of debt, and the new cold war, is to own gold – the traditional safe haven – and gold juniors which are the the best leverage to a rising gold price.